I've been put aside Movie Monday-challenges but now I found the time&will to do one, about Christmas movies. Last weekend me and my lovely kid/friend/lover/youdecide Maria had our own 'christmas party' at my step moms place in Sipoo where we were looking after her dogs(that lovely rottweiler Army<3 and Remu). Anyways, we ate lots of candy,pizza other crap and watched christmas movies, home alone 2, polar express,Santa Buddies and the Search for Santa paws. 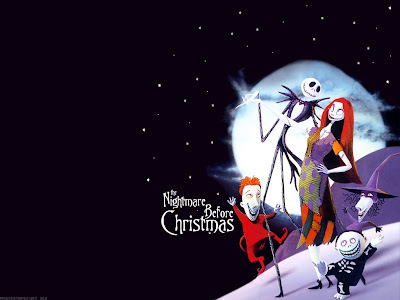 We didn't have the time to watch my ultimate favourite X-mas movie, and it is very very VERY surprisingly The Nightmare before christmas. I'm actually kind of boring person what comes to my x-mas movie taste, it is very traditional and I don't have any cool aces in my pocket that would be 'so underground and like indie movies'. My favs along with this one, are home alones, Grinch, Buddies, and oh well, does Gilmore Girls Christmas episodes count? It just IS so good, I can't help it. There is no christmas without it. Ps. One of my fav love songs is in this movie, oc Sally's song. Too often I have the feeling that someone must have written than song about my feelings.